I discovered papas arrugadas, wrinkly potatoes, on a trip to the Canary Islands, where they are ubiquitous. Partly because they’re gluten-free but partly because they’re really tasty, I had them almost every time we ate out. At first I thought they might be difficult to make. I also thought they might take a special kind of potato, since some websites said they’re made with special Canarian potatoes. Nope on both counts. In supermarkets I saw bags of very ordinary new potatoes, grown in various locales around Europe, marked “papas para arrugar” (potatoes to wrinkle). 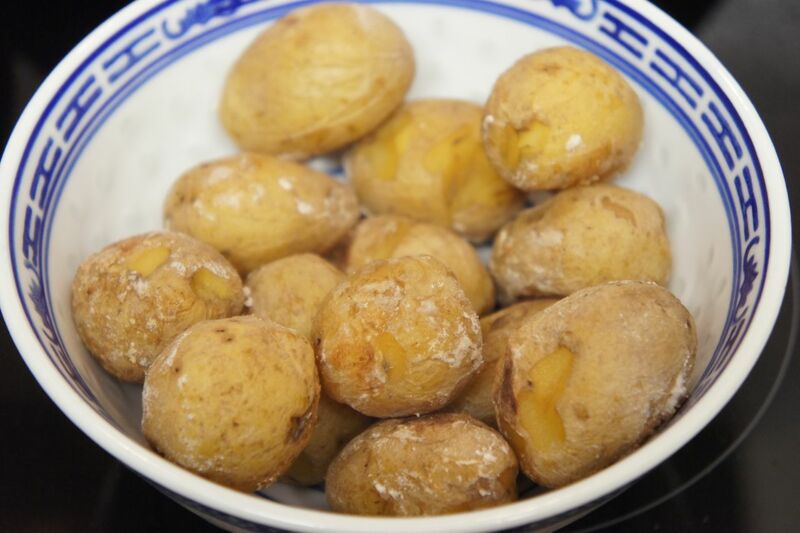 Maybe the Canarios don’t want the word to get out but the fact is, papas arrugadas are very easy to make and taste the same in England, made with English potatoes, as they did in Tenerife. It’s Robbie Burns Day, which marks very nearly a year since I started this blog. I hadn’t actually been planning to blog this meal, so please excuse the relative lack of pictures, but when I realized it was almost my blogiversary, I took a picture of my plate just before I dug in. Good thing too. 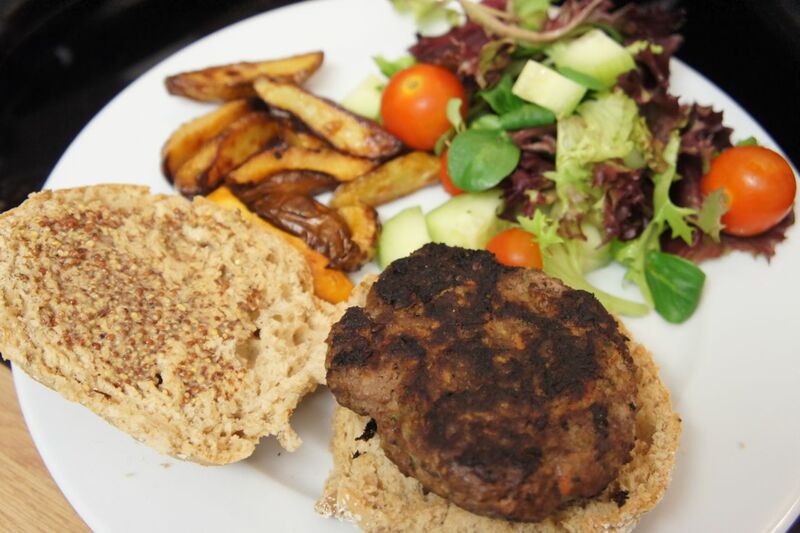 Because my impromptu creation in honour of Rabbie Burns turned out truly delicious. Inspiration for this nominally Korean dish comes not from Seoul but from the streets of Los Angeles, where apparently the popular Kogi BBQ truck has spawned a number of imitators around the U.S.
A friend of mine recently shared a recipe for flourless banana pancakes and I was so excited, I immediately tried it out. The recipe called only for one mashed banana and two eggs, mixed together and fried like a pancake. It did work, rather to my amazement, and my kids loved them, but the resulting “pancakes” were very light, difficult to flip, and not really pancakey enough for me. I love cornbread muffins but a lot of them are too crumbly for my taste. I get that cornmeal is crumbly by nature but it gets to be too much when it’s difficult to eat. 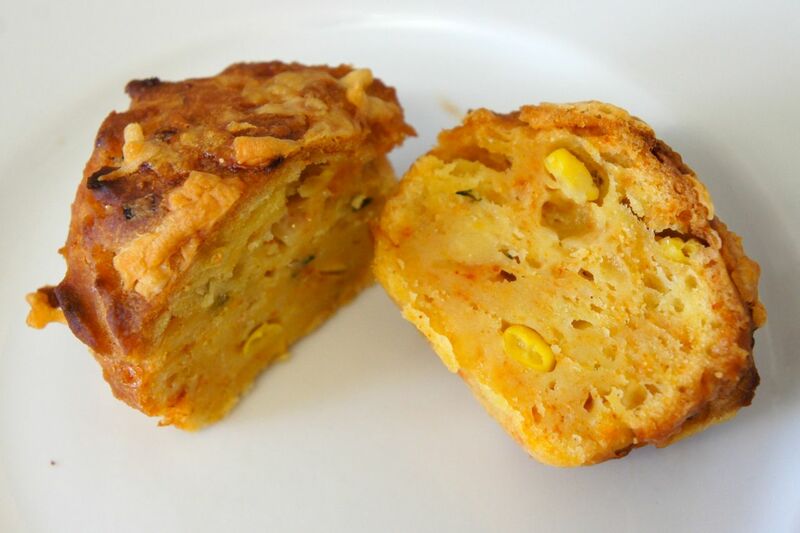 These gluten-free savoury cornbread muffins are moist and not crumbly at all. With the addition of cheese, corn kernels, chives, and smoked paprika, I got a tasty, easily packable breakfast or lunch food that reheats well. Plus they’re refined-sugar-free! Pulled pork is one of my go-to recipes for something that’s really simple to make but tastes complex. Also, my kids love it. Sometimes I spice it Mexican style, for pork carnitas, but for American week I decided to do it with barbecue sauce for sloppy, delicious pulled pork sandwiches that taste like a sunny day drinking beer and listening to the blues (perhaps at Kitchener Blues Festival). I know, slow cooker pulled pork isn’t quite the same as pulled pork smoked over a wood fire. But I don’t have a fire pit. Here in our temporary home in England, I very sadly don’t even have a barbecue. 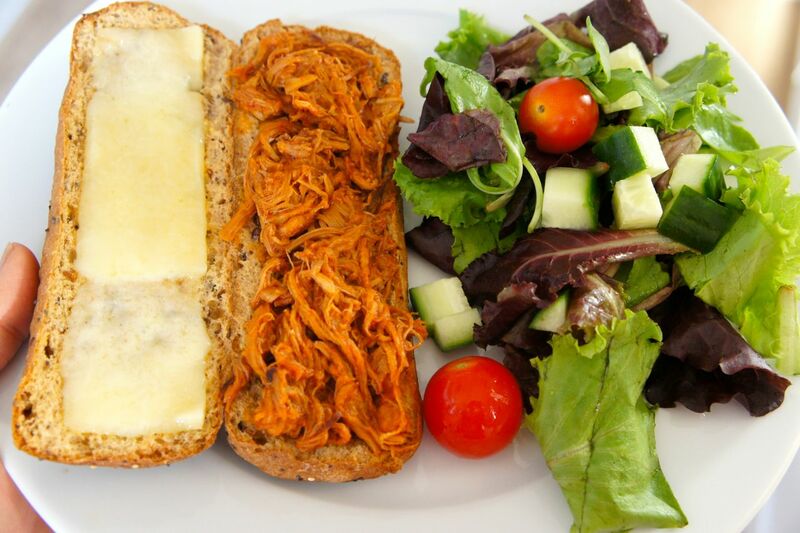 However, pulled pork in a slow cooker is not only super easy, it’s really, truly, delicious. With the right sauce it’s honestly hard to tell the difference between this and something cooked by an award-winning barbecue chef who used three kinds of wood chips in just the right proportions. 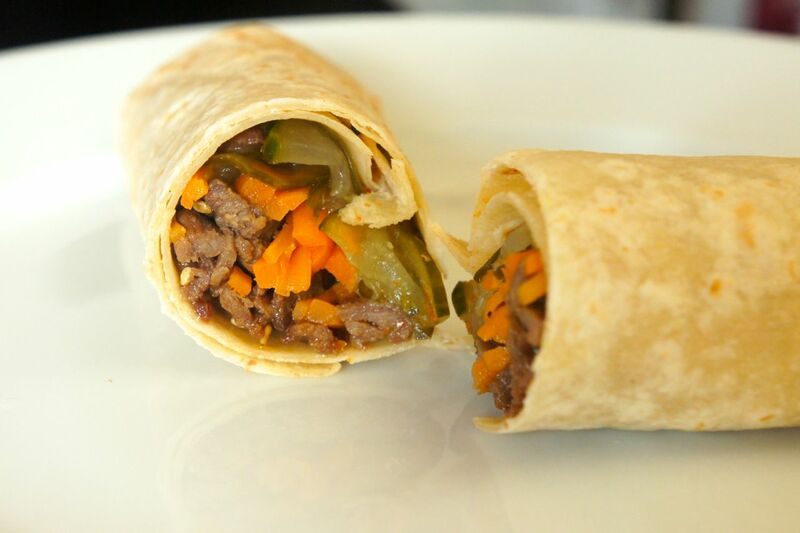 Indian taco flat on a plate – to eat, bend in half and eat like a Mexican taco. I always feel weird saying “Indian tacos” since they’re not at all Indian in the subcontinental sense and not really tacos in the Mexican sense. Also, I feel uncomfortable using “Indian” to refer to the First Nations of North America. But nobody says “First Nations tacos.” The Aboriginal friends I had growing up on the prairies in Canada would have laughed at me if I’d tried. Indian tacos are Indian tacos and they’re as authentically First Nations as Irish stew is Irish (despite the fact potatoes are native to South America) and as vindaloo is Indian (even though chilies too are from the New World). 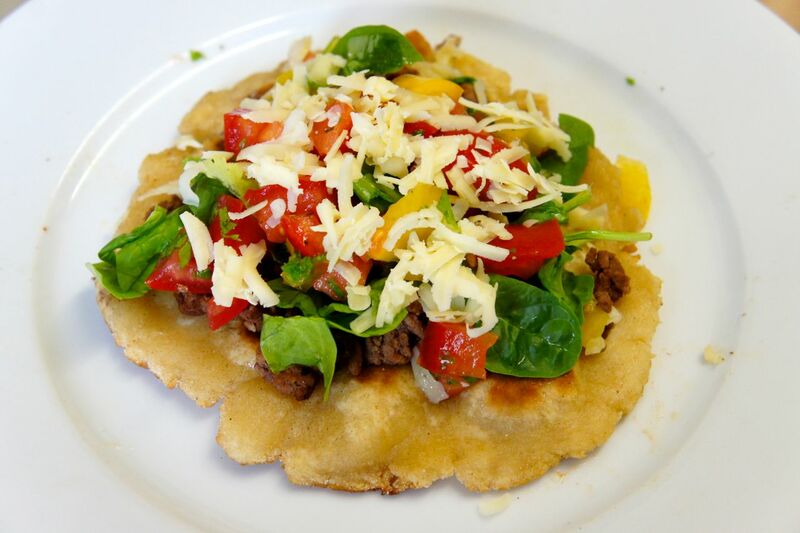 What makes an Indian taco “Indian” is that, instead of a corn tortilla, it uses fried bannock, AKA fry bread. As to the rest, it usually contains meat, cheese, tomatoes, and lettuce. Sour cream is optional. Salsa is optional. If you want to make it even more North American Aboriginal, you can use ground bison. I, however, didn’t have any, so I used ground beef, which is, I would guess, the most common filling in Indian tacos anyway.